The BBC is to close its Religion and Ethics messageboards to new comments or threads later this month, with a new blog to be brought in later in the year. Announcing the changes in a blog post commissioning editor for religion Aaqil Ahmed explained the cost of maintaining the messageboard “has become impossible to justify for a relatively small group of users”. The changes follow confirmation of a 25 per cent budget cut facing BBC Online. We’ve had to make some tough decisions but I want to assure you that the decision to close our BBC Religion and Ethics messageboards was not taken lightly, as I know users have enjoyed being part of the varied discussions on the messageboards about all kinds of religious and ethical topics. However, the cost of maintaining this messageboard has become impossible to justify for a relatively small group of users. What’s more, as we’ve seen with the meteoric growth of Twitter, Facebook and other social networks – there are now many ways to interact and share information online. Instead the site will launch a new BBC Religion and Ethics Blog later this year, which will be hosted by an expert editor, based in Salford and part of the BBC’s Religion and Ethics team. We’ll host contributions from leading figures in politics, religion, news, ethics and the media. The blog will be a new way to take a topic further and find out more, whilst also offering you the chance to participate in a wider religious and ethical discussion. This entry was posted in Editors' pick, Social media and blogging and tagged #budget, BBC, bbc cuts, discussion, messageboards, religion and ethics, savings on June 14, 2011 by Rachel Bartlett. The Guardian reports this morning that some journalists on BBC programmes including Newsnight, Panorama and Radio 4’s Today programme could be replaced by a “pooled system of journalists”. According to the Guardian’s report the possible idea was outlined to staff on Tuesday by BBC News director Helen Boaden. The change would affect the news programmes department within BBC News, which is separate from the main newsgathering operation providing stories for the TV and radio bulletins. In a statement the BBC said it was “not going to get drawn into a running commentary”. No decisions have been taken and therefore these claims remain speculation. Any decisions coming out of the process would be subject to approval by the BBC Trust. This entry was posted in Broadcasting, Editors' pick, Job losses and tagged BBC, bbc cuts, Broadcast, journalist jobs on May 13, 2011 by Rachel Bartlett. The BBC Caribbean Service broadcast its last programme on Friday and on Saturday the BBC Russian Service went on air for the final time. Both services have been broadcasting for seven decades but have been axed as part of BBC World Service cuts in an effort to save £46 million a year. Around 650 jobs are being lost as part of the 16 per cent budget cut and the World Service has estimated that the cuts will cost the service 30 million listeners. In this BBC Russian Service broadcast, Gabriel Gatehouse, who, until recently was based in Baghdad and who started his career with the BBC Russian Service, looks back at the Russian service’s 65 year history. This entry was posted in Broadcasting and tagged bbc cuts, BBC Russian, BBC World Service, gabriel gatehouse on March 28, 2011 by Sarah Marshall. An opinion piece in today’s Independent recognises that the BBC has some tough decisions to make when it comes to finding ways to save money, but says that the corporation shouldn’t be immune to budget cuts. No one could dispute that such reporting [of global news] is at the very core of the BBC’s public-service broadcasting remit. But savings are going to have to come from somewhere, and the BBC should be no more immune from the need to prioritise than any other organisation. The BBC is currently undergoing the Delivering Quality First review to try to find ways of coping with no increase in the licence fee for the next five years. Several ideas are on the table, including cutting programming on BBC local radio stations between the breakfast shows and drivetime shows when the stations would broadcast Radio 5 Live. 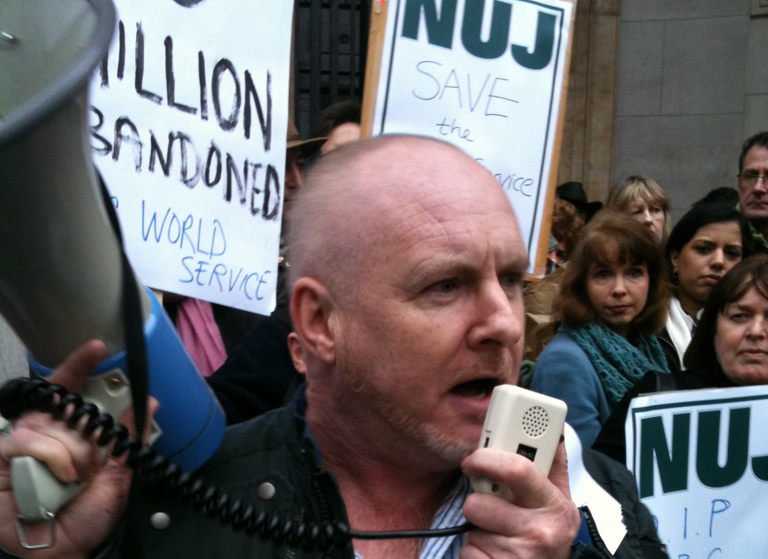 The NUJ has warned this could see 700 jobs axed. The Guardian is reporting today that overnight programming could be scrapped as another cost saving measure. This entry was posted in Comment, Editors' pick, Jobs and tagged BBC, bbc cuts, cuts, delivering quality first on March 23, 2011 by Sarah Marshall. Our reporter Rachel McAthy is at the protests outside the BBC World Service offices this afternoon. Members of the National Union of Journalists are demonstrating against budget cuts announced today at the service which will result in the loss of 650 jobs as well as the closure of numerous language services. This entry was posted in Broadcasting, Events, Job losses, Journalism and tagged BBC, bbc cuts, bush house protest, mike workman, nuj, World Service on January 26, 2011 by Rachel Bartlett. 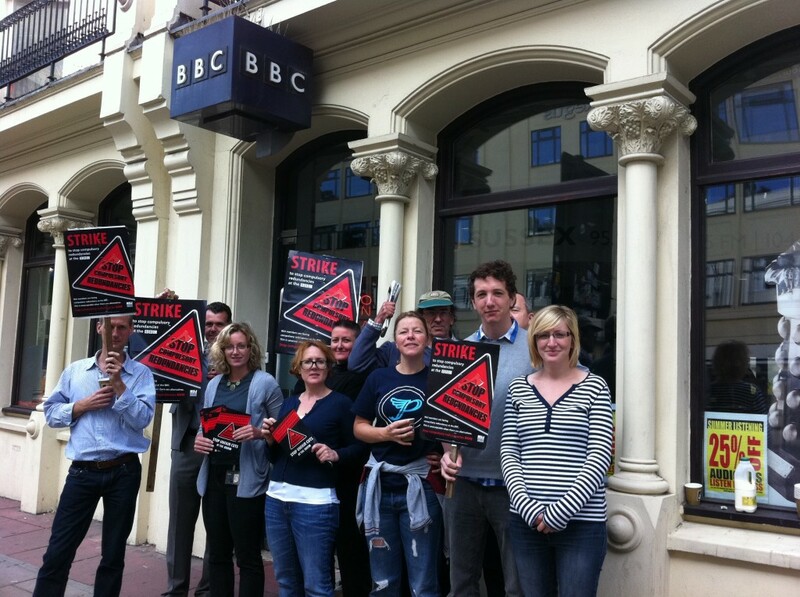 #bbcstrike: What’s going on at the BBC today? This entry was posted in Broadcasting, Journalism and tagged BBC, bbc cuts, bbc pensions, bbc strikes, bbcstrike, BECTU, industrial action, nuj, staff unions, strikes, Unite on November 5, 2010 by Laura Oliver.